Objective: Maintain features and finishes of original home while repairing and updating bathrooms, replacing carpet with hardwood floors, and adding a deck with Jacuzzi to the backyard of the home. Results: We completed several remodeling projects in this 1920’s home over the course of two years. 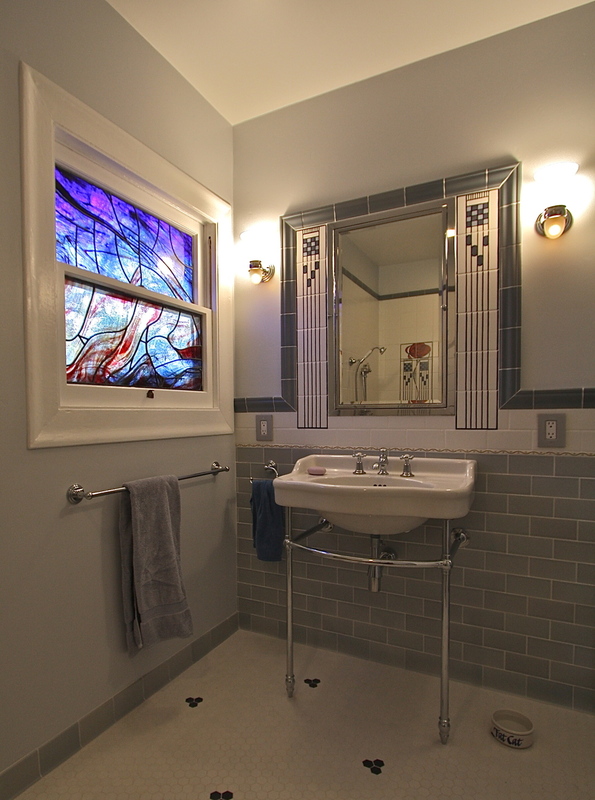 Designer David Underwood of Underwood Architecture created the design for remodeling two of the home’s existing bathrooms. The owner liked much of the original detailing but was willing to re-think use of space and updating fixtures to incorporate those she had seen in her daughter’s London home. The project including repair of the existing plumbing and incorporating adjacent space into the interior of the bathrooms. In one bathroom, we annexed an adjacent half bathroom and for the other, we reconfigured adjoining, built-in closets which increased the interior square footage of both bathrooms. We replaced a bathtub with a damless shower incorporating 12 sq. ft. of area from adjoining half bath. Materials were thoughtfully chosen to feel like originals. We matched new floor tiles to match the existing tile design exactly. Several other original features remain incorporated elegantly with new components finished in a way to match the age of the home. Other notable features include hand painted mural tiles by Lucia Fort’s Studio/Art on Tiles. 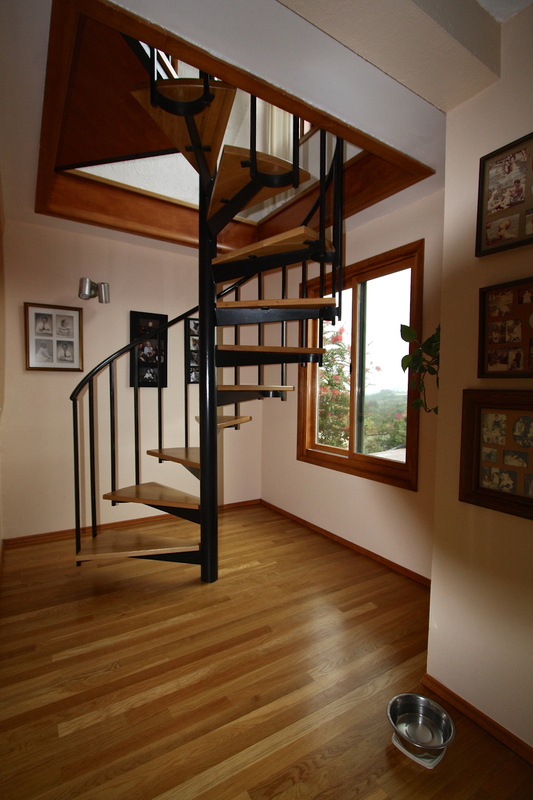 At different times, we also replaced the carpet on the lower level with oak hardwood floors, including new treads for the spiral stairs. We also added a deck and jacuzzi in 2012 replacing an aluminum window and sliding glass door with a beautiful and energy-efficient fiberglass window and french doors to provide access to the new, multilevel deck and jacuzzi. The deck and steps follow the contour of the yard providing a thoughtful and seamless transition from the home to the backyard space. After: New tiles fit the period of the homes 1920’s origin. The floor tiles are an exact match to original. Before: Pedestal sink and cracked tiles. Before: Tub-shower with plumbing problems and damaged tiles, etc. After: New damless shower incorporating 12 sq. ft. of area from adjoining half bath. Before: Old pedestal sink, carpeted floors. After: New cabinets with tile countertop, wood floor under carpet was refinished. Several original features remain and new components done in a way to look older. Before: Built in closet which was removed and the space was given to the other bath for a large shower. After: New cabinets allow for almost as much space as was in former built in. Before: Carpeted floors and stairs. After: Oak floor and spiral stair treads. Before: Sliding door and steps to back yard. After: Multilevel deck and jacuzzi. Aluminum sliding door and window replaced with fiberglass french door and window. Before: Electric panel and other utilities very prominent. After: Deck follows contour of the yard, a lattice enclosure screen utilities from view.